It has been over a year since my last post, and since then, I have started developing my own blog. (I was just a guest author here.) It is called Coffeeshop Physics, and it is a relaxed presentation of physics topics that I think are interesting. The name was inspired by my experiences with Cafe Scientifique, a series of coffeeshop presentations about the sciences— I want to replicate that kind of atmosphere online. Whereas the Everything Seminar was intended for mathematical audiences, Coffeeshop Physics is for general audiences, much like Cafe Sci. Therefore, I don’t assume that the readers know what a derivative is (relevant for yesterday’s article), but you might find it interesting anyway. Many of the topics that I’m writing about are things that I struggled to understand as an undergrad and even a grad student, the intuition behind the mathematical formalism. For instance, my favorite article so far is about curved surfaces and gravitation. When I studied general relativity, I could push Christoffel symbols around, but I was frustrated by the fact that I couldn’t visualize the problems that we were working on. I got a better appreciation for curved surfaces by learning to sew, and after making about a dozen little models, the picture came into focus. Here is a photo of a model of space-time at the surface of the earth, in which we can see that a freefall is a shorter path through space-time than just standing on the ground. It doesn’t have Minkowski structure, so it is not quantitatively accurate (it should open up at the top, not the bottom), but it is a picture to keep at the back of one’s mind. I’ve also turned the spectrum of resonances in electron-positron collisions into a sound, so that we can hear what it sounds like when the collide, and found a nice demonstration of entropy in a story about a leprechaun tying ribbons on trees in a forest. If you enjoyed the What Killed Madame Curie? detective serial that I started on this blog, I am expanding it into a novel, with links on the site. I misunderstood a point in the press release that wasn’t heavily stressed. The LHC has become the world’s highest-energy accelerator, reaching counter-rotating energies of 1.18 TeV each, but the beams were not collided at this high energy yet. Last week, they were collided at low energy, and this week, they have been accelerated to high energy, but not collided. The two beams passed by each other in the interaction region, held apart by electric fields. A few protons on the fuzzy outer edge of the distribution might have collided, but the big collisions are yet to come. Small steps, yet very fast from one step to the next. the first paper based on LHC data has been submitted to the arXiv (by ALICE). The π0 observation represents the first step in “rediscovering the Standard Model” as part of the detector commissioning. It’s like a walk through history, where this step is at about 1950, when the π0 was first discovered in cyclotrons and cosmic rays. The above plot shows invariant mass distributions of pairs of photons observed in CMS and LHCb. From every pair of photons, you assume that they came from the decay of a particle and plot what the mass of that particle must have been. For many pairs, the assumption is false, so you get a combinatoric background of random photons, but for photons that actually came from π0 → γγ, you get a peak at the π0 mass. The combined distribution is a peak on a smooth background. Most particles in the Standard Model are known only through their decay products, and this is the first example to be seen at the LHC. Since we already know a lot about π0s, we now use them to calibrate the photon detectors. Needless to say, these algorithms are not just being developed now— they’ve been in the works for years. That explains how ALICE was able to put together and internally approve a paper based on the first collisions in one week. For a brand new analysis, that would take many months at least! 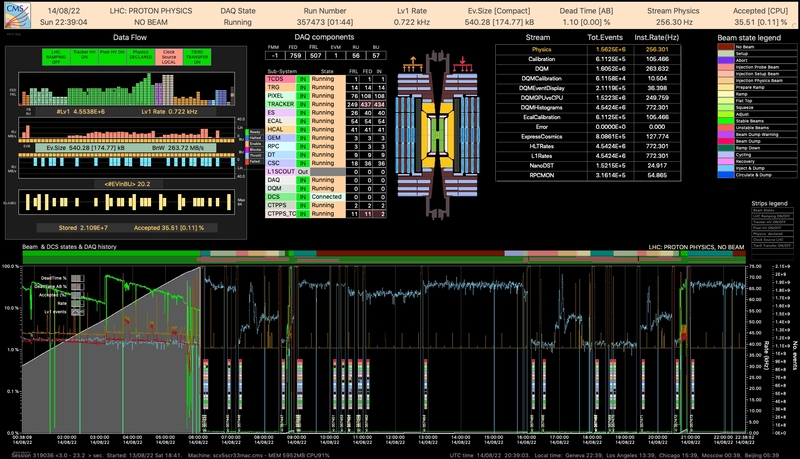 Protons have orbited the LHC! 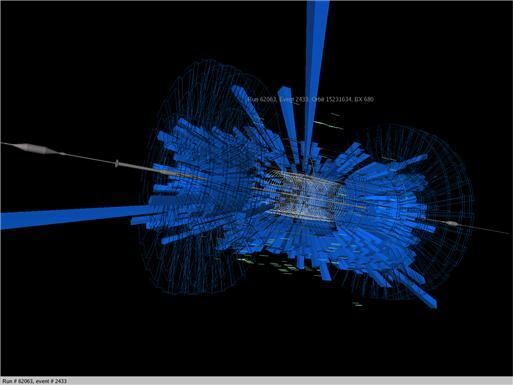 The beam went three times around the LHC ring: see CMS’s e-commentary and CERN’s twitter. This is the milestone that was a big media event last year (September 10, 2008). Update: now it’s 500 times around the ring (about 0.05 seconds). Last year’s record was about 9 minutes of continuous beam. See CMS e-commentary for live updates. “Beam-splashes” are when a beam is threaded part-way through the LHC ring, then deliberately collided with an absorbing block of tungsten to stop it, upstream of a detector. Many particles are created in this collision, most of them are absorbed, with the exception of the muons and neutrinos. CMS can detect muons, and what it sees is a huge splash of activity, shown in this event display from September, 2008. The blue bars indicate huge deposits of energy in the calorimeters. They seem to project from the center of the detector, but this is an artifact of the software, which was designed to visualize collisions from the center. The calorimeter cells measure energy, not direction, so when it sees energy coming from a flood of particles arriving from the right, it draws them as though they came from the center. You can also see little parallel lines surrounding the central burst like a school of fish. These are individual muons seen by the barrel muon detectors, which do measure direction. Update: here it is, the first CMS beam-splash of 2009 (from the e-commentary page)! The little red lines are reconstructed muon tracks, blue dots are raw hits, and the yellow/blue starburst in the center is the calorimeter energy. You can tell that the beam is coming from the right-hand side of the detector (“LHC beam-1”, the clockwise direction around the ring).